The KiteGen is a very technological and ambitious project to transform wind energy into electricity in a way that respects nature. Exploiting the currents of high altitude more powerful and the constants of KiteGen large kites are able to produce very large amounts of clear energy by exploiting the wind. But the important thing is that the Italian KiteGen is based in Chieri near Turin. 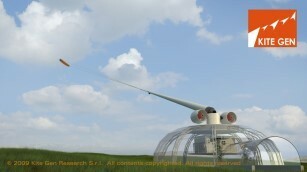 The Kitegen aims to make the most of the energy that can be derived from the wind. With traditional wind energy installations in fact is exploited only a small part of the energy of the wind. In fact, the traditional wind towers have now reached a structural limit and can not be raised further to get to altitude wind, wind turbines currently no more than 100 feet above the ground, the structure that sustains them becomes, with increasing height, exponentially heavier, unstable, and above all expensive. The technologists Kitegen therefore has a huge potential. Today’s news is that the Turin-based company has expressed interest in purchasing the plant in Sardinia by Alcoa. The project would be to use renewable energy sources, wind, using the KiteGen to power the plant in Sardinia. This is a unique opportunity for the Italian Government to give an impression of ecological industrial policy, we hope which should not be bureaucratic obstacles make it difficult for the project. After the protests in recent days of Alcoa workers this could be a great opportunity for development. Questo articolo è stato pubblicato in ECOLOGY, ENERGY, ENVIRONMENT, GREEN ECONOMY e contrassegnato come energy, kitegen, power, wind da pippomelchiorre . Aggiungi il permalink ai segnalibri.